In February of 2018, I spent 3 days in Death Valley National Park exploring and doing photography. This article is going to cover my recommendations on what to bring for photography in Death Valley. But first, some background on the place itself. Death Valley is the lowest, hottest, and driest place in the in the North America. Photographically it’s best known for a handful of locations, including the Badwater Basin salt flats, the Race Track, and Zabriskie Point. However, the history of the area is quite deep. Though low, hot, and dray, there are natural springs in various parts of the valley making it habitable. Moreover, the harsh nature of the valley protected those early inhabitants from outsiders. The Timbisha Shoshone settled in the valley more than 1000 years ago, surviving in the valley’s harsh conditions. The valley’s name and reputation would be solidified during the gold rush of 1849. However, the next major long term establishment would take place in the late 1800s when silver and borax were discovered in the valley. Both being valuable, though for different reasons and uses, brought people to the valley to harvest the minerals. Admittedly, the history of Death Valley is far broader and deeper than I’m covering here. The National Park site, has more information on it. Moreover, the Death Valley Natural History Association sells a number of books covering the cultural and natural history of the valley. As an aside, most of the National Parks in the US have non-profit organizations associated with them. These groups work with the National Park service to support, develop, maintain, and improve visitor awareness around the park. In many cases, it’s their efforts that develop resources in the park that otherwise wouldn’t exist. Purchases from these organizations, help contribute to these goals. Death Valley NP is reasonably close to several major population centers. Driving, its about 2.5 hours from Las Vegas and 4.5 hours from Los Angeles. If you’re flying to get there, I would suggest flying into Las Vegas, and driving from there. Las Vegas’s draw as a destination generally insures that you can find relatively direct and generally inexpensive flights pretty easily. Driving from Vegas to Death Valley you have a couple of options. You can head west out of Vegas on US-95. When you reach Amargosa Valley, turn left on NV-373 and follow that to Death Valley Junction. At Death Valley Junction, you turn right onto CA-190 and that will take you all the way into the park. The other route, is to head south out of Vegas on I-15, and go west on NV-160. You then follow NV-160 through Pahrump, NV, turning left on Bell Vista Ave / County Line Road. This road leads into Death Valley Junction where you’ll make a right (go north) on CA-127 then almost immediately turn left on to CA-190 and follow that into the park. Personally, I chose to go through Pahrump. It’s a fairly large town that has a Walmart and multiple gas stations, making it a good choice to pick up supplies (like water) before you head into the park. Though admittedly, you could do that in Las Vegas just as well. That said, access to gas on the north route is more limited, and while you can buy gas in Furnace Creek, it’s quite expensive compared to filling up outside the park, especially in Nevada. Death Valley Junction get’s its name from being the junction of the Death Valley Railroad and the Tonopah & Tidewater RR. More information on the Death Valley Railroad can be found on the DVRR page at Pacific Narrow Gauge.com or on the Wikipedia page. While the Death Valley RR has long since been removed, and the facilities at Death Valley junction are gone, the grade can still be seen both in Death Valley Junction and to the south CA-190 for most of the way into the park. The DVRR climbed ultimately to mining town of Ryan, Ca. The town is currently under the care of the non-profit Death Valley Conservancy. I’m not currently clear on what kind of access there is to the Ryan town site. Though the intent as I understand it is to stabilize the town site and open it to the public. Access to Death Valley is both good and difficult. The park itself is deceptively large, sticking to paved roads, driving from the southern entrance to the northern most entrance is a 2:00–2:15 drive, with most of the roads being having speed limits around 50-60 MPH. Crossing the park east to west, 1.5–2 hour drive as well. Moreover, many areas in the park are only accessible by dirt roads. Some of which are substantially rocky, and have a reputation for destroying tires. This is something to keep in mind if you’re driving a rental car. Moreover, recovery services are extremely expensive if you need them. For example, access to the renown Racetrack, is really only accessible to 4×4 vehicles with off road capable tires. Standard rental cars, including crossovers and SUVs, are not recommended and the rocks in the road can easily puncture standard all-season tires. Moreover, if you’re going to the Racetrack, it’s approximately a 3.5 hour drive from furnace creek (each way) to get there. 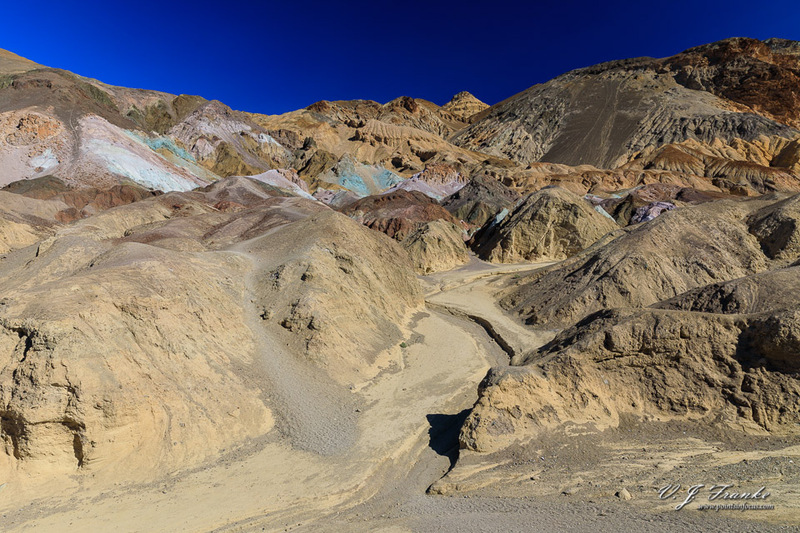 The photographic opportunities in Death Valley fall largely in the landscape camp. While there is wildlife, it’s sparse through most of the park, especially on the salt flats. As such, big telephoto lenses aren’t really necessary. My kit when I visited consisted of my 5D mark IV, my 16-35mm f/4L IS USM, my 24-70mm f/2.8L II USM, and my 70-200mm f/4L IS USM along my 1.4x III teleconverter and an 12mm extension tube just in case. In reviewing the metadata, the vast majority, by far, of what I shot was shot with the 24-70. As always, a crop camera is also a perfectly alternative to full frame for the kind of shooting you’ll find in Death Valley. Camera gear out of the way, you do want to bring some accessories. A tripod is a good place to start. While there are plenty of opportunities to shoot handheld, there’s a lot going for the slower more deliberate pace of shooting from a tripod. For this trip, since I was packing super light, at least by my normal standards, I ended up going with a Benro travel tripod with my Really Right Stuff BH-55 head. So functionally speaking, the Benro worked perfectly adequately, at least so far as I can tell. That said, I never was all that comfortable with the super light weight of the tripod with my big heavy DLSR on top, though it never tipped, leaned or otherwise acted unstably. That said, I didn’t run into any situations where a tripod, or the one I took specifically, couldn’t handle the terrain. Another good bit of kit to bring is a circular polarizer. While sunrise and sunset are ideal times to shoot, there are places on the valley floor where the hard light, and hard shadows, of the day (though perhaps not midday) can make for interesting images. In these cases, having a polarizer to really make the sky deep blue is handy. However, if you’re not use to working with a polarizer, it would be advisable to either get out and get some practice in ahead of time or make sure you remember when it’s on lens. This is not an exhaustive list of place, and I haven’t been to all the places listed. However, the places on this list either provided me with images I liked, or were intriguing enough to me that I want to go back specifically to visit them. 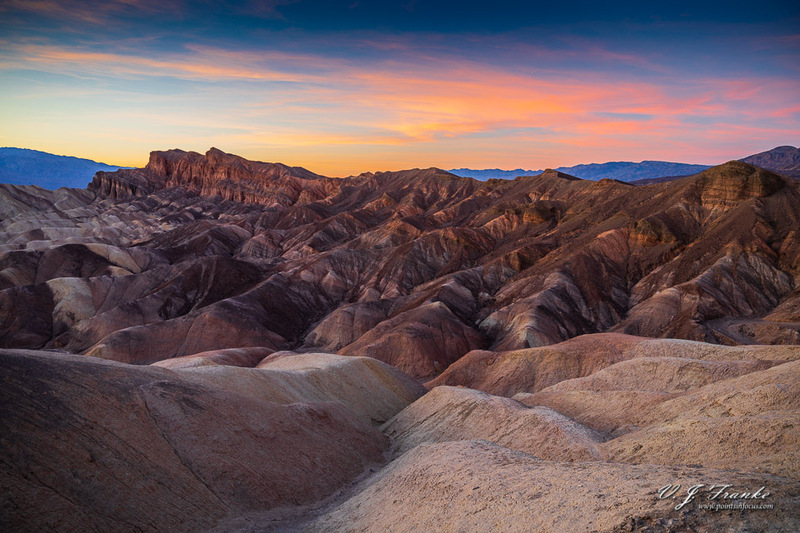 Zabriskie point offers a number of interesting photographic opportunities, from solid large scale landscapes of the valley to interesting abstract images of rock formations. As well as some possibilities for dark sky night photography and astrophotography. That said, there’s very much a seasonal factor in shooting at Zabriskie point. When I was there in mid February, the sun was setting quite far to the south. This produced some good light and color on the one major formation north of the viewing platform, it left the rocks to the south in shadow at sunset. In mid-March, and mid-September, the setting sun will line up much better with the valley that leads from the point down in to the valley proper. Of the two, I would choose March a better time of year than September, simply due to the temperatures. Right now, as I’m writing this at the end of September, the National Weather Service weather station at the Furnace Creek visitor center is reporting daytime highs in excess of 110°F (43.3°C). However, in March of 2018, the highs reported from the Furnace Creek visitor center were in the low to mid 80s. Finally, throughout the summer, the sun will set north of Zabriskie point, which will illuminate the rock formations along the southern walls of the canyon. However, the temperatures during this time of the year, will make visiting, let alone photography an unpleasant at best affair. As for the night sky, Zabriskie point does offer a reasonably good view. However, the main east-west road through death valley passes not far from the point and headlines from passing cars will be an issue. Also, the point is high enough that the Black and Funeral mountains to the east won’t block the sky glow from Las Vegas, and the Panamint range to the west doesn’t extend far enough south to do the same for Las Angeles. While this can be an interesting effect in a wide enough image, as shown above. I’m not sure it makes the best overall approach. 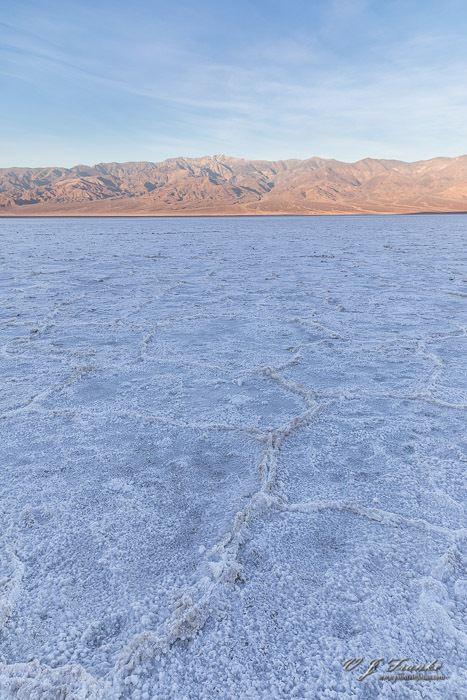 The salt flats of Badwater Basin are another iconic death valley site. They’re also the lowest point in the park, and with that North America. Photographically there are interesting opportunities both at the landscape level, as well as the on a more macro level. The basin runs north-south with with 4000–5000 foot Black Mountains to the east, and the 8000–10,000 Panamint Range to the west. This means that for sunrises, the earliest morning light will be blocked by the Black Mountains to the east. That said, I wouldn’t discourage early morning shooting in the basin. The sand dunes at Mesquite Flats don’t have quite the same problems with sunrises that the Badwater salt flats do. Especially in the winter, when the sun is rising further to the south. Additionally, there’s quite a lot of interesting foreground material in the sand dunes that can be worked into an image. Darwin Falls is one of the few places I really wish I had made it to see when I was in Death Valley. Darwin Falls is spring-fed, year-round waterfall in the middle (okay on the edge of) the driest place in the US. Access is a bit more work than the previously listed places. Head west on CA-190 from Panamint Springs. About one mile west of Panamint Springs, an unpaved road branches off to to the left; this is Darwin Falls Rd. Drive 2.5 miles down Darwin Falls Rd. to reach the parking area for the Darwin Falls trail. From the parking area off Darwin Falls Rd, it’s approximately a 1 mile hike (2 mile round trip) over relatively flat ground to the falls. Though there’s no formal trail, you follow the dry wash to the south up the canyon till you reach the spring. Depending on the source, I’ve found estimates fo 250-400 feet of elevation gain over the mile long trail. The National Park Service describes the trek as, “Although there is no formal trail, the mostly level, one-mile walk to the falls involves rock scrambling and several stream crossings.” Most other hiking sites suggest that its not a difficult passage, either. The waterfall is at the end of the canyon. Based on my understanding of the canyon surrounding the water fall, the best light is going to be in the morning. Vehicle needed: Two-wheel-drive, high-clearance recommended; four-wheel-drive may be needed after adverse weather conditions. Two-way section from west OK for two-wheel-drive, standard clearance vehicles. This is also another one of the places in Death Valley that I would have liked to have seen but didn’t have time to do. The Titus Canyon road is one way from the east to the west. To access the canyon, drive out of the park on Daylight Pass Road / NV 374 towards Rhyolite and Baetty, NV. Two miles past the park boundary there’s a turn off to the left (if you’re leaving the park) that is the start of the Titus Canyon Road. The National Park Service, recommends allowing 2 to 3 hours to drive the Titus Canyon road. If you’re doing photography, plan for half a day. Rhyolite is not technically part of Death Valley National park, but it’s close enough, especially with the start of the Titus Canyon road being where it is, to warrant at least a moment of discussion here. 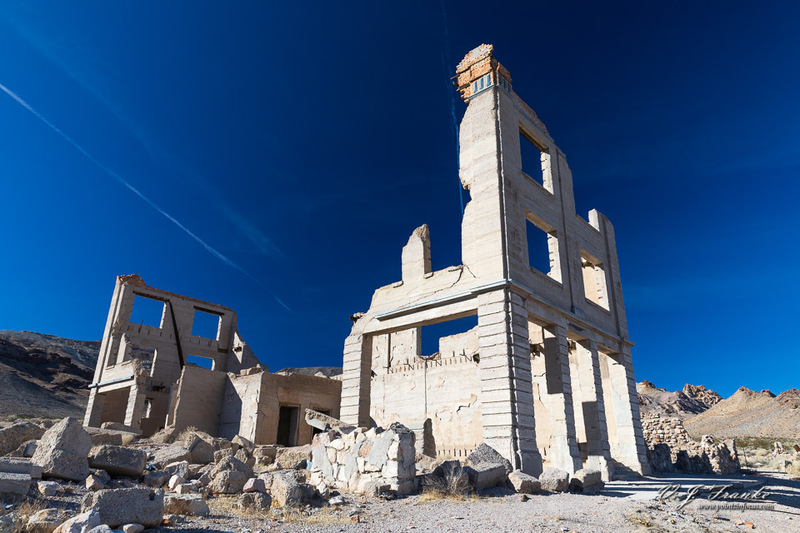 I’m a little bearish on Rhyolite as a photographic location. It’s perhaps not the kind of ruined town (I have a hard time calling it a ghost town) that you might expect. There’s a single standing building, the former Las Vegas and Tonopah Railroad station in the main area of the town, and the Bottle House off a ways. The rest of the town is decidedly ruins. Some interesting images can certainly be made in the ruins, and exposed weathered wood on the few wood buildings makes for interesting textural shots. That said, most of the ruins are concrete. Artist Palette, accessed from Artist’s Drive, get their names from the multicolored clay stones in the valley walls to the east of the road. The Artist Palette formation and many of the formations along the rest of the drive are popular in no small part because they’re easily accessible. Artist’s drive is a well maintained paved one way road. The formations themselves are located on the eastern side of the valley, so the best light for photographing them is in the afternoon.